A few things have managed to happen since my last post! 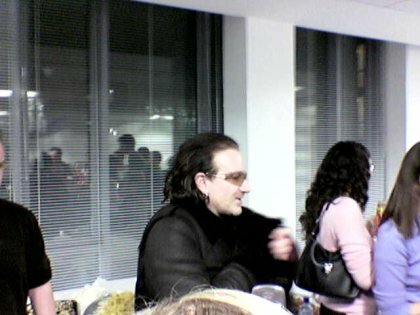 Bono visited the Ireland office 10 days ago. He talked for a while on his charity projects on debt and AIDS and then got swamped by the hoards of adoring fans. I was lucky enough to see Mikhail Gorbachev visiting the Mountain View office recently, it's time we had some exciting visitors of our own. Then we had our fancy dress Christmas party, lots of fun. Plus Jasmine had her birthday party yesterday - we managed to survive and she had a laugh with all her friends.